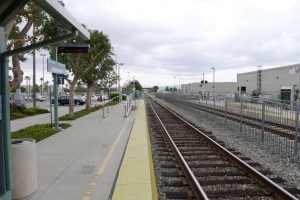 This is the last stop for the Los Angeles Metro Orange Line and the transfer point between Orange Line, Metrolink, and Amtrak. This station is served by Ventura County Line. Ticket machines and 10-ride ticket validators are located on the main platform. Purchase or validate ticket before boarding. This station features side platforms. Pacific Surfliner trains stop at this station. Train tickets can be purchased from Metrolink ticket machines. Ticket machines are available at the platform entrance. First time riders must purchase a reusable TAP card with a fare from the machine before boarding. All riders must "tap" the TAP card or TAP-enabled ticket/transfer at a validator when entering platforms and keep the card or ticket for the duration of the ride. This is the northern end of the Orange Line. 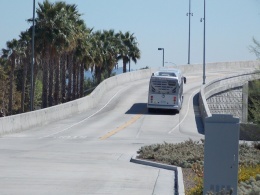 All buses from this stop depart to North Hollywood Station or (weekday peak hours only) Warner Center. Chatsworth Station - Plummer St. - Coldwater Canyon Av. Free parking is available at this station. This page was last edited on 12 December 2018, at 04:06.